LOUIE VEGA RE-ENERGIZES A GENRE WITH NYC DISCO DOUBLE ALBUM Grammy award winner Louie Vega is known worldwide as one of the finest creators and purveyors of house music, both as an individual artist / producer / dj and as partner with Kenny Dope in the renowned production team known as Masters At Work. His multiple musical talents have also brought him much acclaim in the genres of salsa, afro-beat, jazz, hip-hop and soul. Last year he reached another career milestone when his album “Louie Vega Starring…XXVIII” was nominated at the 2017 Grammys for Best Dance Album, which further solidified his position as one of the industry’s premier artist / producers. But not everyone knows about Louie’s deep respect, admiration and knowledge of the disco genre that laid the foundation for so much music that moves crowd on dancefloors and festivals today. Louie’s connection with Nervous Records and it’s father / son founders Sam and Michael Weiss goes back to the label’s very early years, as Masters At Work gave the label some of its earliest hits along with its signature release “The Nervous Track” by Nuyorican Soul. Louie was always aware of the many disco hits that had been released by Sam on his Sam Records label back in the 70’s and 80’s. But it was not until recently that Louie suggested Michael send him the 24 inch multi -track masters of seminal Sam Records disco classics like Gary’s Gang “Keep On Dancing,” John Davis & The Monster Orchestra “I Can’t Stop,” Convertion “Let’s Do It,” Vicky D “This Beat Is Mine,” as well as several others. The multi-tracks are a treasure-trove, including musical contributions from some of disco era’s finest musicians and engineers. Going through the various percussion, horn and string tracks inspired Louie to create a series of remixes that became dancefloor anthems that topped the Traxsource and Beatport charts and reverberated on dancefloors worldwide. That response, and the common drive that Louie and Michael both share to constantly promote quality music that is both song and rhythm based, inspired them to take this endeavor a step further, and to create brand new songs. When Louie’s creative energies start flowing, his team knows to rise to the occasion. 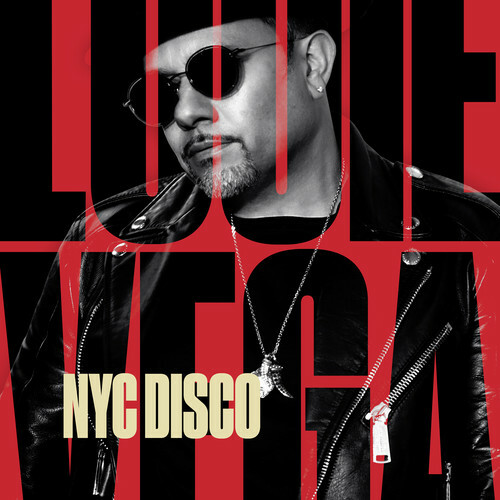 The result is NYC Disco, an album that represents the full range of disco  related genres including the following: *Gospel Disco  “He Promised Me” (Louie Vega Remix) BeBe Winans Featuring Tobbi, Tommi & Kiandra Richardson *Jazz Funk Disco – “Love Paradox” Louie Vega Featuring The Martinez Brothers *Abstract Punk Rock Disco  “Rebel Nation” Louie Vega, Patrick Adams & Cloud Two Featuring Anané *Diva Disco – “Love Having You Around” Louie Vega Featuring Rochelle Fleming & Barbara Tucker *Breakbeat Disco – “I Can’t Stop” (Louie Vega Remix) John Davis & The Monster Orchestra Featuring DJ Jazzy Jeff *Disco House – “Dancing For Your Love” Louie Vega Featuring Cindy Mizelle & Sharon Bryant *Underground Funk Disco – “Get With The Funk” Louie Vega Featuring Josh Milan *Iconic Disco – Dance (Disco Heat)” (Louie Vega Re-Touch) Sylvester *Soulful Disco – Love Fantasy” Louie Vega Featuring Cindy Mizelle *The Essential Voice of Disco – “Get Myself Together” (Louie Vega Remix) Luther Vandross *Feel Good Disco – “Bourgie Bourgie” (Louie Vega Remix) John Davis & The Monster Orchestra This is just a sampling of the NYC Disco album. As the project was initially inspired by the Sam Records catalogue, CD 2 of the double CD contains 12 special tracks from the Sam Records catalogue re-edited and remastered by Louie to work for today’s music world.